In a bowl, combine biscuit mix with water; stir until just blended. Turn onto a floured surface and knead for one minute. Roll dough out to 1⁄2-inch thickness. Cut out 8 biscuits with a 3-inch round biscuit cutter. Arrange on an ungreased baking sheet. Bake at 425 degrees for 8 to 10 minutes, until golden. Meanwhile, in a skillet over medium heat, brown and cook sausage patties; drain. In a separate skillet over low heat, scramble eggs in butter to desired doneness; season with salt and pepper. 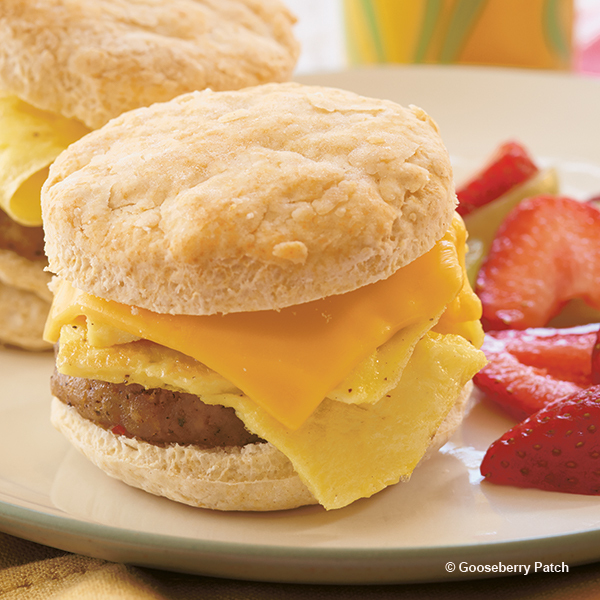 Split biscuits; top each biscuit bottom with a sausage patty, a spoonful of eggs and a cheese slice. Add biscuit tops and serve immediately. Makes 8 servings. Enjoy this recipe from Meals in Minutes: 15, 20, 30 Minute Recipes originally published 4/15/18.